I’ve just had to setup a test system that load balances a site running on Tomcat across multiple computers. My test bed is 3 mac minis, one working as the ‘head’ running Apache, and the other two in the ‘farm’ handling the load. It was a less than painless exercise, so I thought I’d write up the instructions. On each farm machine rename the folder to be Tomcat, then move it to the /Library/ directory. (You don’t need .bat or .exe files, but you do need other files to be executable). (Note that the username and password are examples from Tomcat – you should probably change them). Repeat the above for each farm machine. Open each of your farm machines in turn from your browser, e.g. Click Tomcat Manager and enter the username and password you defined above. 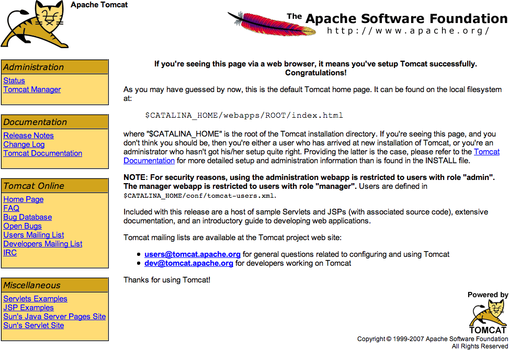 This should show the Tomcat Web Application Manager screen. Upload the war file of the application you want to run. Once complete you should see a link on the manager page to your application. Click it and make sure it works OK.
Download the source code and build your own version. This isn’t too hard if you have the relevant tools already installed – look here for an excellent step-by-step on the changes you need to make to build a 64 bit version. , which appears to have the facility to create a 64 bit version (I haven’t tested this). Download the 64 bit version of mod_jk 1.2.26 that I created. I may update this as I go along, but no guarantees! Once you have your mod_jk.so file (if it doesn’t end up with that name, change the name) copy it to the /usr/libexec/apache2/ directory of your head machine. It’s worth changing the ownership and permissions of the file to match the other modules using the commands sudo chown root:wheel mod_jk.so and sudo chmod 755 mod_jk.so. Note that you’ll need to set the location for your log file, and the name of your application. It’s a good idea to create the log file (e.g. use touch mod_jk.log in the directory you want it; this makes sure the file can be created, which would otherwise trip Tomcat up. The worker.maintain setting helps determine how long one farm machine will be used before the load switches to another machine. For testing I used 5 (seconds); the default is 60. Tomcat should still be running on each of the farm servers, so start Apache on your head machine by opening System Preferences…Sharing and checking the ‘Web Sharing’ box (if it was already checked then uncheck and recheck it to restart Apache). Browse to http://head/your-application – you should see your application! Yes, it’s that time again. Actually I started this because I have a post where I’m trying to publish a snippet of text beginning with an xml declaration, and I can’t get it to display – even using the pre tag it seems the browser tries to render it as something other than the text. Any suggestions gratefully received – right now I’m going to see if a bit of white space will fix it. Oh noes! Look what book Obama is reading!. It’s The Post American World! Clearly Obama is swotting up on how to bring America’s dominance to an end, encourage the rise of Muslim holy war, and something about Manchuria. On the other hand, the opening line of the book is “This is not a book about the decline of America, but rather about the rise of everyone else.” It explains what might happen in the future, based on the informed opinion of a respected foreign commentator. I know that thinking about the future and stuff is out of fashion, but I consider it a good sign that we might have an American president who understands that wishing doesn’t always make it so. Seriously, this scared the… OK, I can’t find a nice way of saying how much it scared me, but my heart was pounding and my arms and legs went all numb. And that’s just from watching the (safe for work) video. It’s literally unimaginable for me to actually walk this trail.